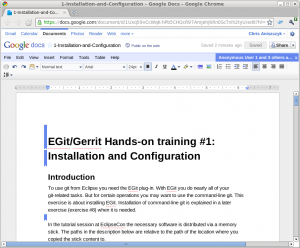 If you’re attending the Effective Git tutorial at EclipseCon 2011, it would be great if you could get an early start by doing the first tutorial exercise. It would benefit everyone if tutorial attendees took the time to setup as there are nine total exercises to get through. It’s a bit of work to go through the first exercise and setup a Gerrit account. If everyone is setup, we can spend less time on the first exercise and more time on the other exercises. However, if we can’t get through all the exercises, everything is available online for you to finish at your own convenience. We are eventually looking to make this material more consumable and are even considering doing a book. Anyways, I look forward to spreading the Git love tomorrow afternoon!